Our swing clip file is primarily used to keep A4 files and documents. It is made from high quality PP material, and has the features of being beautiful, durable, and tear resistant. Today, our swing clip file is increasingly popular with customers from the USA, Canada, Australia, Britain, Germany, Italy, France, etc. Founded in 1988, Deli Stationery is an experienced swing clip file supplier in China. To ensure customers find the product they require, we provide a great variety of products, including P file bag, stapler, paper punch, paper trimmer, pencil sharpener, glue sticker, calculator, and more. High quality and low priced, our office supplies are extensively used by enterprises, schools, governments, etc. Hanging File Keeper FC1. The slide bar coated with OEL is easy to slide, thus making this file keeper easier to obtain documents. 2. This hanging file keeper is provided with classification labels for users' convenience. O-Ring File Keeper 2 Hole1. This O-ring file keeper is made from 100% imported PP material. 3. 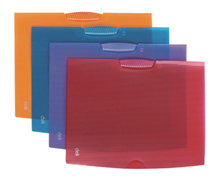 Our file folders have a wide range of styles for your option. .